Dr. Chatterjee is a human physiologist with specialized training in immunology. He completed his Ph.D. while working as a research scientist at Bhabha Atomic Research Center, Mumbai India, a premier research institute of the Department of Atomic Energy, Government of India and affiliated to the University of Mumbai. He has made significant contributions to the field of immunotoxicity in pro-inflammatory disease processes like heat stroke, sepsis and inflammatory liver disease, especially nonalcoholic steatohepatitis. 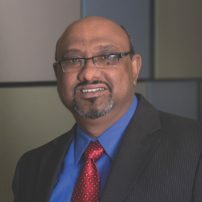 Dr. Chatterjee is also appointed as an adjunct Associate Professor in the Department of Cell Biology and Anatomy, USC School of Medicine (August 2015- present) and adjunct Associate Professor in the Department of Biological Sciences, Clemson University (July 2017- present). His research experiences at the National Institute of Environmental Health Sciences (Laboratory of Pharmacology and Toxicology, PI: Dr. Ronald P. Mason) and Duke University School of Medicine (Gastroenterology) as a postdoctoral researcher greatly enhanced his expertise in inflammatory liver disease in obesity and how the oxidative stress of environmental toxicants cause obesity-induced disease. He received the prestigious NIH pathway to independence (K99-R00) funding from NIEHS in 2011. He has also received $7,564,895 million Extramural: $7,300,895; NIH (P20, P01), DOD (IIRFA), VA (Merit) grants and Intramural: 264,000 ; USC VPR, USC Pilot Grants. Elected as a council member and Board of Directors, Association of Scientists of Indian Origin, Society of Toxicology, 2015. Outstanding Young Investigator Award 2015, Society of Toxicology, Immunotoxicology SS, recognizing the contributions to the field of immunotoxicology in the last 10 years. Society of Toxicology Board of Publications Honorable Mention Award (3 out of 300 publications (2013-2014) January 14, 2016.